RUSH: I have to tell you: Folks, all these people wondering why Hillary Clinton lost? (chuckles) I’m watching it. There’s some forum that CNN’s carrying. Fox just joined it. The women’s international women, women international women-women, women international… Whatever! She’s being interviewed by Christiane Amanpour, and it is the most painful and hilarious thing to watch simultaneously. I know Cookie is rolling on it. (chuckles) I don’t even know how to describe this, although I’m gonna try. I know there’s nobody who could do a better job than me telling you what is happening here. RUSH: Now, Hillary — and I know Cookie is rolling some sound on this. Let me see if I can describe this. 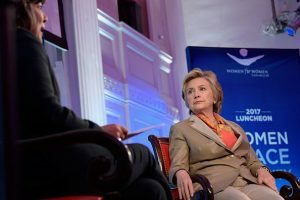 First off it’s a breakout performance, it’s Hillary’s first real sit-down since the election. And it is an interview that’s being conducted by Christiane Amanpour at some organization of women caring about women, women looking out for women, women focusing on women. I can’t remember the title of it, and it’s not on the screen right now so I’m vamping until they get off of this head shot of Hillary and get back to the two shot of Christiane Amanpour and Hillary because that’s where the title of this thing is. That’ll happen in a minute. Women for Women International. Women for Women International. I’m telling you, if you watch this thing, you won’t have any questions about why she lost. When I happened to be tuning in during the break at the bottom of the hour, Christiane Amanpour was asking her (imitating Amanpour), “What can we expect for women in the world, women working together for women, and women.” Every word in the question was women. No, what do they do? I said, what is this? It’s obviously a group that’s devoted to segregation, women and women only doing this or that. It’s predicated on the fact that women are being forever discriminated against and given the short end of the stick. And these women are gathered there while Hillary gives them a pep talk on how they can overcome this. She then got a question about how she feels about the cuts and staff at the State Department, and there aren’t any powerful women there, and what does this mean for the Obama agenda and the legacy, what does it mean for women in the future. Mindless, meaningless stuff that you notice as important, all this surface stuff, you know, gender, all these other things that are important to liberals that are irrelevant when you get down to the nuts and bolts of things. I mean, they talk about how they are tolerant and open and unified. They’re not. They’re the biggest segregators in our culture. They segregate people by group, by color of their skin, sexual orientation, gender, you name it. But it’s just rambling nothingness that we’re getting from Mrs. Clinton here. Misogyny played a role in her defeat. Yeah, so much bias against women. It’s just painful to watch. It’s painful and funny. The one thing about this Hillary appearance, if I had to put an umbrella, everything about it is we are all victims. Women are victims of whatever. She just said she’s a victim of Putin. 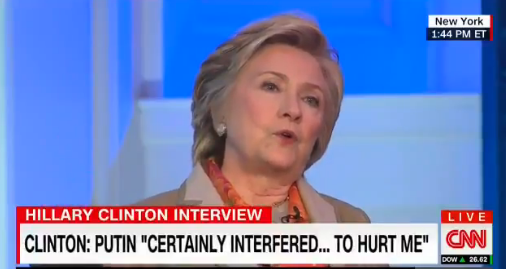 Putin was out to interfere and hurt her. And she was a victim of misogyny. And that’s what this entire seminar is, is all women are victims. And that is classic liberalism, just classic. They’re all liberal victims. That means they all need to be assisted and given affirmative action bumps from the government or what have you. It’s just maddening, is what it is, and to see so many women willingly embrace the idea that they’re victims. Of what?